Jack Stallard (Chrome Plate Technician-Bristol) was recognized on January 17th, 2014, in honor of his retirement from Strongwell. Jack was with Strongwell for thirty successful years. Jack started out as a pultrusion operator and eventually worked his way into chrome plating. He looks forward to traveling, fishing and working on his home during his retirement. One of things he will miss most about Strongwell will be his wonderful friends and coworkers. 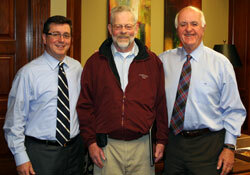 Strongwell congratulates and thanks Jack for his hard work and dedication over the years.